Since his first solo exhibition in 1983, Rim Hyo has been working on the themes of nature. The natural subjects that he often depicted during his research periods of 1983 and 1986 include mountains and rock walls such as Seorak Mountain, Jiri Mountain, Chiak Mountain, Sorak rock wall, Yongbawi rock wall, and the Wall of Hongdo. 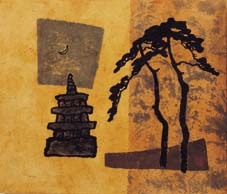 From his third solo exhibition in 1990, new mythological elements such as a female saints, a sacred tree, hanbalksan, and gaechundaedo were introduced in creating a unique visual world on the extension of the themes of nature. Later, this continued into "Legend" "Suffering and "Deliverance"and "picture Goot"in which the subject matters of the sun, moon, birds, humans, flowers, pagoda pavilion, and pine trees were added and it is continuing today. Roughly reviewed, the mythological elements are found in his work from his 3rd exhibition in the 1990s to the 11th solo exhibition in 2001 in works such as "sing from nature, 1992" "inactive nature-1994" "nactive nature-amusement, 1995" "In the Arms of the Mother, 1999" "The Sun has gone down, 1999" "The Bottom of a Mountain, 200" and "Gwanbokdo, 2001." 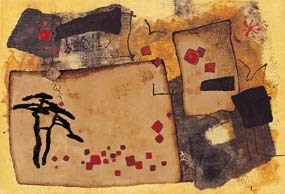 In these paintings, he used condensed brush strokes, sharp irregular lines, and rough and thick in lines of intaglio. They raise the viewers' consciousness of our unique cultural heritage with the suggestive lines of virtuous mind, balmook and heavy silence. 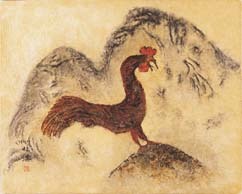 The mythological elements that he has been developing since the early 1990s can be seen as the exploration of the inner nature. They can be seen as signifier that the artist attempts to metaphorically bring out from the artist'inner mind away from the external appearance of nature. Mythology, for the artist, is not something that is found in the existing legend for historical context, as it is usually thought of, but rather if refers to the 'natural state'or 'the world of child's mind' that the artist himself created. In other words, his mythology is the object of the most natural and the most pure world that can be created in the womb of nature. Mythology for the artist, is not a separate thing from nature, but is the essence of nature, and is another name for nature. Furthermore, the artist thinks the wheel of life creation is the essence of nature and mythology. The wheel of life creation that he is thinking of is based on the circulation of time and history. Instead of being static, it constantly goes through the process of creation and transformation, and thus has the external appearance and disposition of nature. The reason why he has been pursuing continuous transformation in his work can now be answered. It is because he has accepted the circulation of dye and history in the wheel of life creation as the basis of the concept of his work. Reviewing more than 10 solo exhibitions of the artist, we can see that overflowing instances of changes, and we can also find that he does not repeat the same thing, which illustrates this point well. In applying the wheel of life creation into his work, elements of our cultural heritage are used. He does not just use traditional ink painting method. Rather, he uses strong lines and dizzily bright colors of the natural dye. He also shows influence of his search in the folk religious talisman and local shaman. However, more than any thing else, what weaves his work into the context of the wheel of life creation principle is the appeal to the supernatural power of the earth and hand-made Korean paper. These two things have been operating as huge catalysts in between nature and mythology. Among the two, hand-made Korean paper is practically no different from nature and mythology themselves.